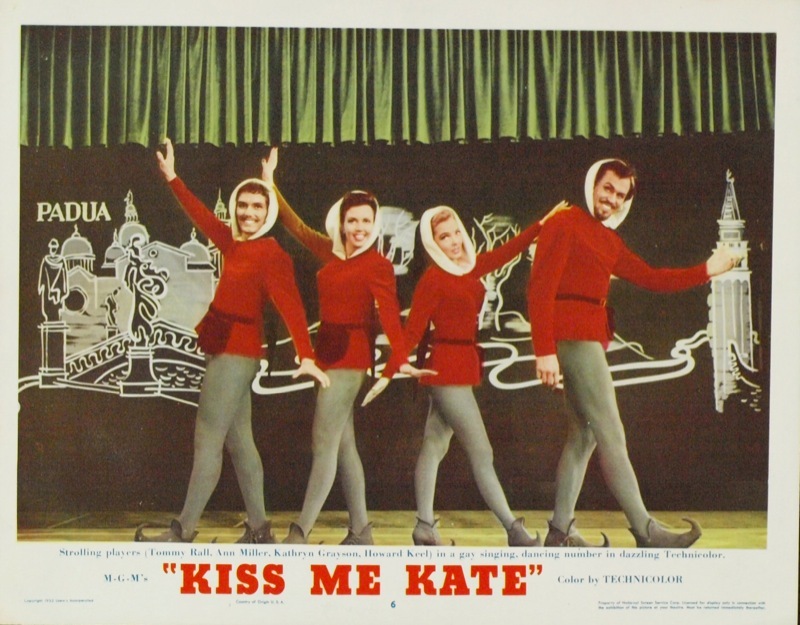 It has been over 20 years since I’ve seen the 1953 film version of Kiss Me, Kate, and I remembered it mostly for the ways it was different than the stage version. So I was delighted to discover that–a few significant, and I do mean SIGNIFICANT, exceptions aside–the movie is actually one of the more faithful stage-to-screen adaptations, with musical numbers that are well sung and cleverly staged, sumptuous and colorful production design, and considerable wit. The first 10 minutes of Kiss Me Kate are as bizarre as any in a film adaptation of a Broadway musical. 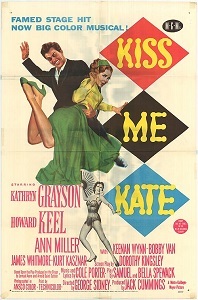 Fred (the large-voiced and handsome Howard Keel) is in his apartment with Cole Porter (played by a Ron Randell), discussing Kiss Me, Kate, which is the title of their new musical version of Taming of the Shrew (the original Broadway text does not specify the writers or title of the Shrew-sical). Fred then has both of his intended leading ladies come in to sing songs from the show…even though both are songs that were written for the backstage half of Kiss Me, Kate and have nothing to do with Shrew. Lilli (Kathryn Grayson) sings a duet version of “So In Love” with Fred (a song she later sings in its proper placement) and Ann Miller’s Lois Lane shows up with her own jazz ensemble to sing “Too Darn Hot”. However, after this odd (though entertaining) bit of revision we proceed with a much more accurate translation of the stage property. Most of the notable song cuts and changes to the score in some way connect with Bill Calhoun, played by the wonderful dancer Tommy Rall. Though his solo number (the admittedly dopey “Bianca”) is cut, both “Why Can’t You Behave” and “Always True to You in My Fashion” are reworked as elaborate dance routines for him and Ann Miller’s Lois, with the latter song giving Rall some of the singing lines as well. Rall and Miller play off each other quite well and their duets are real highlights of the film. The dance break of “Why Can’t You Behave” is includes some instrumental lines of “Another Openin’ Another Show”, which is otherwise cut from the movie. Rall’s Bill/Lucentio also benefits from the addition to the score of “From the Moment On” (a song written for, but cut from, Out of this World), which serves as a wedding song for Lucentio and Bianca. If it gives Rall a bit more to sing, it sits in his lower register, failing to take advantage of the gorgeous tenor that would define his later career. And number is decisively stolen from Rall by one of Bianca’s other suitors, who choreographs his own routine. The movie stops dead when a young Bob Fosse and his dance partner (Carol Haney) enter for their duet: the bright lighting turns a somber, seductive, blue and the rich orchestrations fades to the hiss of a snare drum as Fosse and Haney go through many of what are now Fosse’s trademarks: the limp wrists, the turned-in feet, the sly sexuality. Six months after Kate is released, these two become Broadway legend when Haney premiers his “Steam Heat” in The Pajama Game. There are a few other tweaks here and there: Lilli’s fiancee is no longer a senator named Harrison but a cattle rancher named Tex. Fred and Lilli’s respective butler and maid are no longer people of color (and no longer have songs or an implied romance), “I Am Ashamed that Women are So Simple” is a monolgue with underscoring rather than a song, and many lyrics are sanitized. But ultimately, this movie is every bit as entertaining as it should be. The choreography by Hermes Pan deserves significant recognition. In addition to the previously discussed Bill/Lois numbers there’s a sweeping “Wunderbar” that has Fred and Lilli waltzing through their dressing rooms and the hall in a way that exemplifies musical-comedy romance while seeming almost realistically plausible and charming use of a conveyor belt and rolling backdrop in “We Open in Venice“. The non-dance highlight is Keel’s glorious “Where is the Life that Late I Led?“, performed on a long thrust in the middle of the house. I truly regret not watching this movie more in the past 20 years, and am sure I will not wait so long before watching it again. And maybe there will be a screening at one of our local independent theaters in its original 3-D! ← Why there’s a wench!